We have a variety of fun educational programs for all age groups, from stroller to senior! For additional information or reservations, please email info@austinzoo.org or call (512) 288-1490. Field Trip Questions? Please visit our Field Trip Page. Are you a kid who is wild about animals? Do you have a passion to explore the outdoors? 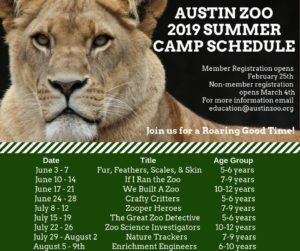 Sign up for Austin Zoo summer camp! We offer 9 week-long camps that are geared for children ages 5-12. Registration is on a weekly basis. During these camps, your child will be busy exploring the animal kingdom through stories, games, experiments, crafts, interactive play, keeper chats and live animal encounters. Austin Zoo is excited to introduce new and improved TEKS driven STEM programming designed specifically for Pre-Kindergarten through 12th grade. Enrich your field trip with hands-on, interactive classes and labs including: Story Safari, Animal Wrappers, Animal Senses, In My Backyard, Animal Adaptations, Owl Pellet Dissection Lab, Animal Behavior Lab, and Biomimicry Basics. Click HERE to download our informational brochure. Download the following scavenger hunts to keep children engaged in learning about various behaviors, adaptations, and habitats of our resident animals. Reserve your custom scout workshop, meet badge or patch requirements, or just come out for a fun day of learning. All workshop pricing includes zoo admission! Click here to see a program flyer. Click here to submit a request to schedule an Austin Zoo Scout Program. If you have any questions, call (512) 288-1490 ext. 106 or email education@austinzoo.org , a $30 deposit is required at time of booking. Let the Zoo come to you! Traveling program options for pre-K through fifth grades are available. To schedule a program, please call 512-288-1490. Austin Zoo offers outreach programs for community organizations such as churches, public libraries and senior citizen facilities. Each program includes audience participation and live animals! Call or email us at (512)-288-1490 or education@austinzoo.org for program options and pricing. Registration is all full for this year, but you can click here to learn more!